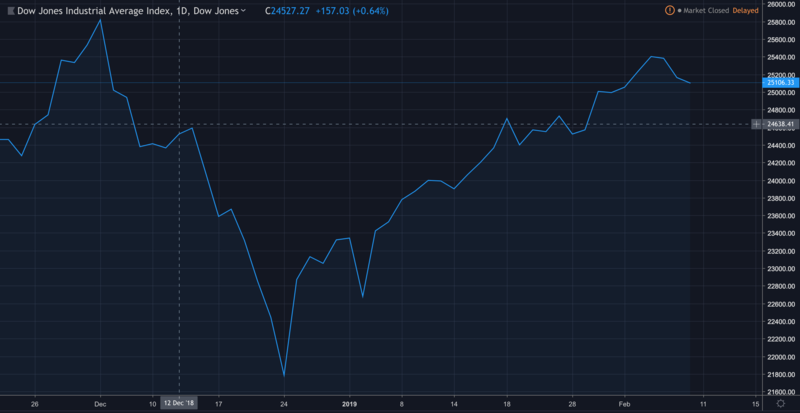 The bullish momentum that Dow Jones Industrial Average [DJI] had been witnessing over the past few weeks is now seemingly weakened as the index took a mild hit at the end of last week. DJI, which has been climbing almost consistently since 22,686 and managed to grow 2,725 points to reach 25,411 between January 3 and February 5, 2019. From that point on, the bearish momentum took over, bringing the index down by almost 1.2%. After opening at 25,371 and losing momentum, the index is currently placed at 25,106. Though on the daily chart it does show a small uptrend, the bullish momentum is seemingly losing its grip over the market. On the kingpin index Dow, the biggest Boeing [BA], UnitedHealth [UNH] and Goldman Sachs [GS] all registered substantial losses while Coty [COTY], Skechers [SKX] and Mattel [MAT] saw double-digit surges on earnings reports. Ubiquiti Networks [UBNT] saw a very crucial rise and made a powerful early breakout on the back of a strong earnings report. Apple [AAPL], Chevron [CVX] and Exxon Mobil [XOM] recorded the maximum loss in opening trade. The speculation and fear over how the market will be affected by the US-China trade standoff are rumored to be the cause of the sudden mild plunge of the index. Robert Lighthizer, the US Trade Representative, and Steven Mnuchin, the Treasury Secretary, is most likely to lead a deputation to China to facilitate debate over the market positions next week. Trump and XI have also tentatively scheduled a meeting, but it will be ahead of the deadline.